Over the past week, the prospect of Michigan repealing its No Fault auto insurance law and replacing it with a pure tort liability system has been in the headlines. I’ve been interviewed by several media outlets about this possibility, largely because I’m familiar with both insurance systems. I’ve worked in Michigan under its No Fault insurance system as an auto accident lawyer for the past 25 years. I also handle very serious motor vehicle crashes, mostly involving truck accidents, in other pure tort states. This has given me a unique perspective to see firsthand the benefits and disadvantages of both No Fault and pure tort insurance states. In addition to blogging and talking with readers on Facebook and Twitter, I’ve also had the privilege of talking to two TV news organizations that are covering this important issue that affects Michigan’s 8 million drivers. To get the full stories, check out the video and article below. What did attorney Steve Gursten say to WXYZ Detroit about the pros, cons of No Fault repeal? Watch my interview with WXYZ Detroit’s Syma Chowdhry (in the video below) where I talk about the biggest pros and the biggest cons if Michigan switched from No Fault to a pure tort liability system. 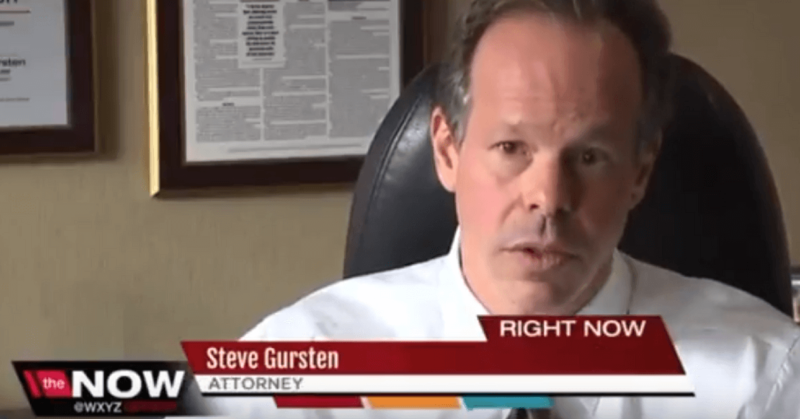 What did attorney Steve Gursten tell Fox 2 Detroit about the difference between No Fault and pure tort? In my interview with Fox 2 Detroit’s Roop Raj, I talk about one of the big differences between No Fault and pure tort which is Michigan’s requirement that people injured in an auto accident must first show that they have suffered a “serious impairment of body function” in order to bring a lawsuit against a negligent driver to receive compensation for their injuries. Pure tort states do not have the “serious impairment of body function” threshold requirement and the negligent at-fault driver is responsible for all harms and losses that they cause. In addition, pure tort states have car insurance premiums that are significantly less expensive than Michigan’s auto No Fault insurance costs.